This is a rare opportunity to own a custom craftsman style home on the deepest part of Magnolia River. Located in the historic, quaint Magnolia Springs. Gorgeous 1.3 acre private lot with beautiful mature flowering trees and bushes. The Main home offers single story living with 2 master suites and a office that could be converted into a 3rd bedroom each master has a attached bath. 3rd bedroom with built in&apos;s was used as a office. River views from the kitchen, master bedroom, living and dining room from the floor to ceiling windows. The Living room features a cathedral ceiling with a wall of windows, floor-to-ceiling brick fireplace and custom wood beams and trim. This great open floor plan has split bedrooms and a large kitchen with attached mud room and laundry. Original solid oak hard wood floors throughout the majority of the home. A huge 50&apos;x12&apos; screened porch runs the width of the back of the home and is accessible from the living, dining and master bedroom. A great spot for dining and entertaining with river views. There is a 2 bedroom, 1 bath guest apartment located above the double carport. Enjoy boating and a water sports right from the dock, and boat slip on the deepest part of Magnolia River. 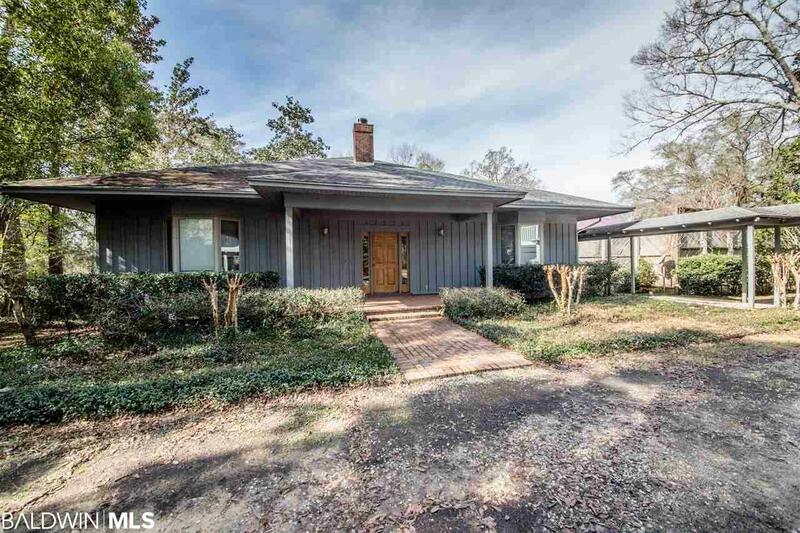 This home offers a unique lifestyle opportunity on beautiful Magnolia River. A home you will enjoy and create wonderful memories for years to come! Directions: From Hwy 59 In Foley Head West On Hwy 98 To Cty Rd. 49 (Magnolia Springs Hwy) Take A Left On 49 And Cotton Stocking Lane Will Be On The Right. Home Is At The End Of The Street. From Gulf Shores, Head N Of 59 Then West On Cty Rd 12 To Cty Rd 49. Take A Right To Magnolia Springs And Cotton Stocking Lane Will Be On Your Left.